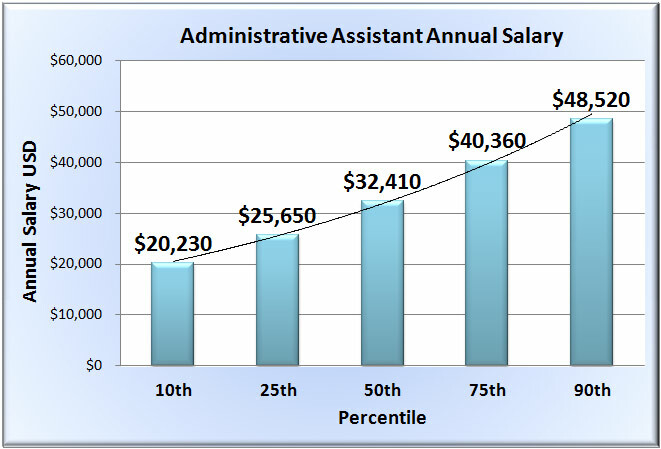 The average salary of an administrative assistant has been estimated to be $33,560, with a mean hourly rate of $16.13. 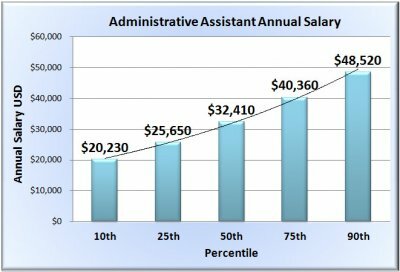 Administrative assistants who are in the top 10 percent of salary levels earn about $48,520 each year, while the annual salary of the lowest 10 percent is about $20,230. Those who work in postal services, federal government executive branches, central banks, telecommunications and pharmaceutical companies are offered the highest pay. The salary earnings of an administrative assistant may also differ depending on the location. The top paying states include District of Columbia, Massachusetts, Connecticut, New Jersey and California, with the mean annual salaries in each state well above the national average. Bonus levels vary from job to job. However, an administrative assistant may earn an amount of up to $2,025 each year. Commissions may also be paid, and can add up to about $7,272 each year. The number of administrative assistants in the United States in 2012 was 2,085,680. Administrative assistants commonly work in schools, colleges, universities, employment services and hospitals. Overall employment growth for administrative assistants is estimated to be at 12 percent from 2012 to 2022. But rates vary for different types of administrative assistants. For example, it is expected that there will be barely any change for executive assistants and a 3 percent decline for legal administrative assistants. On the other hand, employment of medical administrative assistants is predicted to rise by 36 percent.